5 out of 7 (71.4%) reviewers said they would recommend this vehicle to a friend. Let's say you're young, you don't want an "Uncle/auntie" Car so in terms of style, you're looking for something sporty. But to be really practical, you're not going to be able to take more than 1 friend to go to Thompson so you can't get the 2 door convertible. So you compromise: You accept that it's going to be a relatively bigger crossover/suv, but you also get a sleek sporty look. Okay so you also say you want something that has good speed/power. The C-HR Hybrid? Well, it's FINE. It's average. You DO get to seamlessly merge on highways and overtake lanes without anxiety wondering if you're going to make it on time, but you ALSO have to deal with the fact that suddenly the whisper quiet hybrid engine has to work a bit (it's not untolerable) and suddenly there's some noise coming in. Lastly a few notes that I noted are different from my experience and what others are saying about this car. 1) You CAN actually change the language of the dashboard to English, or at least the PI I got it from sold models that could. 2) Rainsensing wipers is available on some models of the C-HR or at least on the one I got. 3) Blindspot. Yeah it's not great that I do agree. It takes some getting used to (by waiting additional few seconds of checking repeatedly) but it's doable. 23km/l. Very pleased with the result. I only pump petrol once a week and 1 full tank can go around 800, nearly 900 km. Overall a pretty stable ride, maybe it's because it's also slightly above average size car. Steering feels responsive but not twitchy, like those turn a bit then suddenly bump curb kind. Feels like a conti car to be honest. I don't really strongly dislike this but it's not a performance engine kind of power. It's responsive yes, but more at the lower range. Getting from 0 to the first 40 km/h is fast, but then if you compare 0 - 110 km/h on Malaysian highways, other cars will be faster. But hey, at least it does cruise quite comfortably at 110 km/h. No need to press accelerator hard all the way. I'm suprised no one mentioned this but it's a very specifc and minor problem. So far I have let a few experienced drivers try, but no one seem to be able to completely smoothly bring the car to a stop. It's like between the final 1km/h to 0km/h, there always HAS to be a slight clamp on the brakes and jerk to a stop. One of the most bold design for an SUV, accompanied by striking colors, it easily is a head turner and possibly a distraction on the road. If you dislike blending into the crowd, this is for you with its diamond theme cutting. Great fuel economy and tons of safety features that otherwise only available in more higher end car brands. - Struggling to write 'what I do not like' because there isn't much actually. Started out as one the nicest looking hybrid cars in Singapore and then the drivers started modding it into totally Rice cars. RICE = Race Inspired Cosmetic Enhancement. With the huge 20" Rims, huge 6pot bbk, installing 10 extra DRL on the car itself. Yes! Easily 10 more from stock at the front & back & sides that blind other road users, ridiculous GT-wings, Weight Saving Carbon Fibre bonnets which does nothing because the car is not light in the first place. Quad Exhausts and more. Many went for tuning to get extra 4-7bhp for $800. Wow. What the car was built to be. A hybrid car that looks nicer than a prius. Can send your kids to school asleep as the back windows are so small it creates a darkish room environment. Which some will find 'cramp'. Plenty of spare parts as Grab cars are also using it as their taxi. Slow as a turtle from 50-60km after toyota switch off the hybrid engine at that speed. The dyno curve is out of this world. The max torque & hp is at the starting 1 second and it just decrease rapidly from there onwards. Do not buy the car if you are looking for any sort of decent accereration from this car. Even a rental blueSG car is way faster. Driving for 1.8 S LED for 6 mths. Lots of features including Electronic Parking brake that makes me forget about existence of the handbrake. Sound proofing better then expected and responsive throttle with smooth CVT. 1800cc with a 1440Kg body is well balanced and not underpowered. Blind spot can be solved by having a blindspot mirror becos of the C-Pillar, highspeed cornering must be careful (maybe SUV higher CG?) and ugly rims for the S version that can be replace with aftermarket ones. 12v Plug is positioned in the worst place in the car. 1) I guess the only non-diesel SUV with the best Fuel efficiency. 3) front and rear wheels all disc brake. 4) pricing justifies with all the features that comes with it. 1) poor position of 12V plug. 3) does not comes with fog light. 4) car key is quite big and must buy silicone casing in case dropped and crack the plastic cover. 5) no auto rain sensing wipers. Drive surprising well for a SUV. Best hybrid SUV with no competition. Though have got used to Benz E250 for over 7 years, but after riding this CHR for about a month now, the quietness of the cabin surprises positively. race track before actaul production takes place.That's why this car handles pretty well. 2.) Great design, done by a US designer house, which is surprising for a marque Japanese MNC . 3.) Insulation adequate esp for city roads of S'pore. 4.) Seats are comfortable esp for the Driver and front passenger. Back seats three easily. 5.) Fuel economy great ,averaging 25 kms per litre on combined 60/40 city highway. 6.) Reasonable depreciation for a stylish yet fuel frugal SUV. Bit of rear view blind spot, but definitely not that of an issue really. Handling is good, suspension smoothens the uneven Rd and humps. Steering wheel stiffer than my prev Honda. Happy w the FC. Blind spot not as bad as perceived. Styling not everybody's cup of tea. Interior doesn't go in tandem w the price tag, it's better! Need time to grasp the turning/parking. Silent hybrid engine. Comes w suite if safety features. Get the G model, forget abt the S.
Just felt compelled to write this to potential c-hr buyers out there, look good and tempting but here are my thoughts. I been driving the 1.8 hybrid S spec for 1 week, coming from a 2010 polo that closes the door with a solid thump, the built quality of the c-hr is surprisingly quite good. Hybrid does it job of cutting in and out without much noise. Have to turn of radio and lower ac fan to lowest speed to hear the slight noise during the elec and petrol engine switching. I average 24.4 km/litre. Electic motor run so silent, pedestrian wont be hearing u coming, so do take note. CVT is not for everyone, if you are heavy footed the engine noise is quite high and drones on and on but due to CVT gear ratio is seamless. Skip S and G spec, get Icon only. can fit a mountain bike with front wheel removed to slide from the boot with rear passenger seat lowered. soft touch leather material at the driver and front passenger seats only. contemporary amenites = keyless, adaptive cruise , auto hold etc. Good for young couple no kids . Strictly a coupe on stiles and "adaptable" rear seats for ocassional chauffeur duties. suspension is soft but supportive on bending road. but never in the realm of sport car territory. steering is very light for city driving performance handling it is not. The BLINDSPOT is huge! those carwow and car buyer youtube video from the UK werent joking. You have to dilligently glance over and even if you did a small bike or super low performance car is hidden from your view due to the C pillar (if u even call the door handle part c pillar). Not good for family of 4, kid will not see out of the rear windows as they are too small and too high making it very dark behind. If you really must get c-hr i would suggest u get the icon spec with blind spot monitor. but please be reminded its just a light indicator on your side mirror only. If you are getting from PI like i did, pls note that the langauge in the gauge cluster is in jap and cannot be changed unlike harrier. Although vezels and prius owner kinda live with it, as there are info u can deduce from jap words, but detail info would be nice. hence the icon spec recommendation. The C-Hr is stricly for image conscious owner, design is subjective but if you want a car that is easy to drive u need to look elsewhere. Authorised Distributor Toyota cars are Toyota Alphard Reviews, Toyota C-HR Reviews, Toyota Camry Reviews, Toyota Corolla Altis Reviews, Toyota Fortuner Reviews, Toyota Harrier Reviews, Toyota Previa Reviews, Toyota Prius C Hybrid Reviews, Toyota Prius Hybrid Reviews, Toyota Prius+ Hybrid Reviews, Toyota RAV4 Reviews, Toyota Sienta Reviews, Toyota Vellfire Reviews, Toyota Vios Reviews. Parallel Imported Toyota cars are Toyota Alphard Reviews, Toyota C-HR Reviews, Toyota Camry Hybrid Reviews, Toyota Corolla Axio Hybrid Reviews, Toyota Dyna 150 Reviews, Toyota Esquire Reviews, Toyota Esquire Hybrid Reviews, Toyota Estima Reviews, Toyota Estima Hybrid Reviews, Toyota Harrier Reviews, Toyota Hiace Reviews, Toyota Hiace High Roof Reviews, Toyota Hiace Mid Roof Reviews, Toyota Hiace Standard Roof Reviews, Toyota Hilux Reviews, Toyota Hilux Double Cab Reviews, Toyota Land Cruiser Reviews, Toyota Land Cruiser Prado Reviews, Toyota Land Cruiser Prado Diesel Reviews, Toyota Land Cruiser Utility Commercial Reviews, Toyota Liteace Reviews, Toyota Noah Reviews, Toyota Noah Hybrid Reviews, Toyota Prius Alpha Hybrid Reviews, Toyota Prius Hybrid Reviews, Toyota ProAce Reviews, Toyota Sienta Reviews, Toyota Sienta Hybrid Reviews, Toyota Tank Reviews, Toyota Vellfire Reviews, Toyota Vellfire Hybrid Reviews, Toyota Voxy Hybrid Reviews, Toyota Voxy Welcab Reviews, Toyota Wish Reviews. sgCarMart is the number one car site for buying Singapore cars, including new cars, parallel import cars, Toyota, Honda, Nissan, Volkswagen, Mitsubishi & BMW. 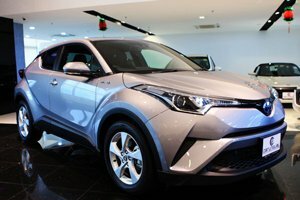 We have new car dealers comprising parallel importers, authorised car distributors, and used car dealers who have the New Toyota C-HR Hybrid latest price Find new car pricelists, new car launches, new car promotions, new car reviews, latest car news & car articles. Read the New.Toyota C-HR Hybrid consumer reviews to help you decide on buying a car. Also join our car discussion and forum discussion for car reviews, motoring news & motoring guides. Visit our partner sites who have job openings for Singapore jobs, Singapore classifieds, mover and real estate properties for sale.